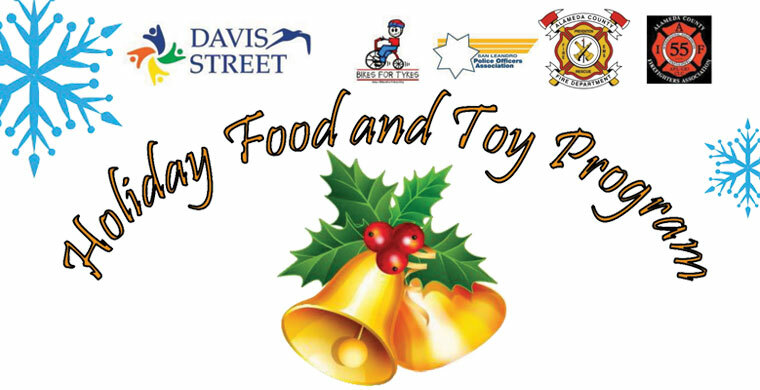 For 46 years, Davis Street, in collaboration with the Alameda County Fire Department, San Leandro Police Officers Association, local schools, clubs, faith-based community, and businesses, has provided food baskets complete with fresh poultry, seasonal canned goods, and new toys for children to thousands of needy families throughout San Leandro, San Lorenzo, Ashland, Cherryland, and Castro Valley. To receive assistance will be November 1st-18th OR until capacity is met. This holiday season, we will distribute holiday baskets, toys, and bicycles to more than 1,000 families and seniors. This takes a month of preparation and hundreds of volunteers. We hope you will join us and get in the spirit of the holidays this year! Davis Street Community Center, Inc.